It is discovered that there exists a quantitative relationship, which can be expressed as \(G=kF(lgP)N\), where G is per capita GDP, F gross expenditure on R & D as percentage of GDP, P patent applications, N Internet users per 10,000 inhabitants, and k a constant ranging from 0.4 to 1.2 in most countries. Thank sincerely Dr. Yan Ma, professor at University of Rhode Island in the USA and Ms. Regina P. Entorf, reference librarian at Wittenberg University in the USA, for their English wording. This chapter was originally published as follows and this version had been modified. Ye, F. Y. 2007. 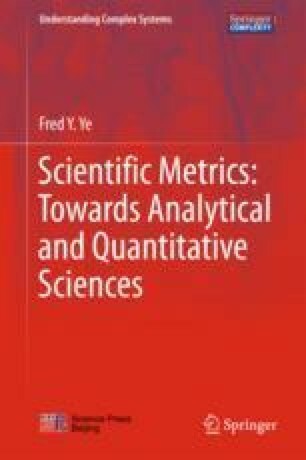 A quantitative relationship between per capita GDP and scientometric criteria. Scientometrics, 71(3): 407–413.